A very unusual relationship has recently been formed. Donna Karan, a New York based designer, abandoned her beloved African beads in favor of… pearls! 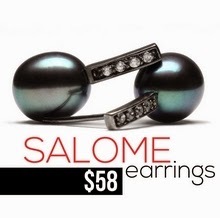 For many years she has strongly favored the organic and sculptural jewels of Robert Lee Morris, but this year she departed from the tribal trend in favor of the ladylike look of pearls. Karan’s fall collection, “Pearls of Wisdom”, is very feminine and wearable. Although the collection did not wow the fashion critics, it still had many great outfits and the taupe and gray ensembles fit well into the feminine trend of the season. Especially her pearl necklaces, single or multiple strands but always in the choker or princess length, adding great finishing touches to these looks. 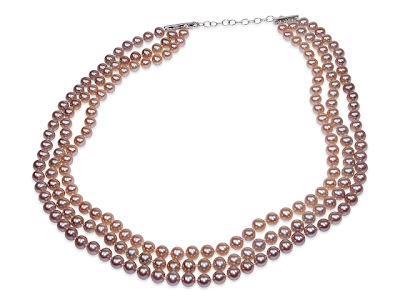 The pearls are large, ranging from purple to golden and silver, and can be worn with any type of neckline. We are happy to see designers embracing pearls this season. It is time we put aside those heavy slave-like chain necklaces and prisoner cuffs and returned to the understated and feminine side of our fashion accessories!